GOP governor: "We need a good partnership, especially in these challenging times"
(CNN) -- Plagued by record budget deficits and massive job losses, local and state officials are looking to the federal government for immediate help. 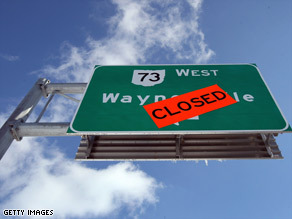 Construction was halted on a new roadway near Wilmington, Ohio, because of budget problems. It sounds like an obvious statement given the daily onslaught of bad news coming from Wall Street. But as the U.S. Senate debates the nearly $900 billion economic stimulus package before it this week, time is slipping away, and help can't come soon enough for politicians desperately trying to help their constituents. Their message to Congress: Stop the partisan bickering and show us the money. Minnesota Gov. Tim Pawlenty, also a Republican, said Tuesday that while governors have virtually no say in what goes into the stimulus bill, Obama's outreach to the nation's governors is a power play to speed things along. "What I think President Obama is trying to do is show that it is a bipartisan effort or to indirectly pressure the Congress in that regard," Pawlenty said. Governors, especially, are trying to keep their states from collapsing under the weight of the recession, and have taken their case to the top. In early December, governors from across the country met with then-President-elect Obama during their annual National Governors Association meeting in Washington. The governors asked for nearly $136 billion for "ready-to-go projects," such as water and sewer projects or building roads and bridges. They also want an additional $40 billion for Medicaid programs. This week, the Senate took up debate on its version of the economic stimulus bill, which the president says will create up to 4 million jobs and reinvest money into infrastructure projects and social services like Medicaid and K-12 education. Douglas, who supports Obama's economic package, said all governors can really do is anticipate what might come their way -- at least until the president is able to sign the bill into law. "I anticipated a conservative amount from the recovery package, for Medicaid in particular. If that doesn't come out well, we'll certainly make the adjustments. It'll be serious, draconian budget cuts, and that isn't right in a time when the American people are really hurting," Douglas said after his meeting with the president. "We're not asking for a handout from the federal government. We're doing heavy lifting at the state level. We need a good partnership, especially in these challenging times." For Douglas, the budgetary woes hit home. "It's not just a matter of the bigger picture or numbers, it's really quite personal in many cases," he said during a photo opportunity at the White House with Obama. "On my floor alone in the office building where I work, four relatives of employees had lost their jobs in the last couple of weeks. So this is a serious matter. It's the kind of recession that is deep." Obama on Monday pledged his full support for local and state officials trying to cope. "Nobody understands this better than governors and mayors, county officials who are seeing the devastating effects on the ground of this economy," he said. "The recovery package that we are moving forward is designed to provide states relief, to make sure the people who are laid off from their jobs are still able to get unemployment insurance, still able to get health care, and that we are putting in place the infrastructure, rebuilding roads, bridges, waterways, other projects at the state levels that allow us to put people back to work." Pawlenty says more money needs to be allocated for more immediate projects like infrastructure rather than unnecessary spending like STD prevention and anti-smoking programs that were recently scrubbed from the Senate version of the bill. "It's gone [stimulus spending] into areas that I don't think that many people would consider the most immediate, direct and timely stimulus," he said. "Most people agree that one reasonable aspect of the spending bill should be infrastructure like roads and bridges." Michigan's Democratic Gov. Jennifer Granholm, whose state has been especially hard hit by the recession and the near-collapse of its auto industry, says job creation is paramount to turning the economy around. That sentiment is echoed by nearly every governor, as witnessed by an urgent statement put out by the Governors Association last week. "States are facing fiscal conditions not seen since the Great Depression -- anticipated budget shortfalls are expected in excess of $200 billion. To address these shortfalls and meet balanced budget requirements, states have begun taking action to cut government services or increase revenue. Absent federal action, states will have to take even stronger actions that will make the recession more severe and slow the nation's economic recovery," the group said in a letter released January 27. The association says governors support key items of the stimulus package, including aid for private investment, job creation and federal support for Medicaid, education, infrastructure and help for small businesses. It's not just governors feeling the pinch on their states. Mayors and other officials also are trying to cope with businesses closing, programs being cut and families being forced out of their homes. "This is an online community designed to invite you to contribute your ideas on the state budget. Your ideas will help the Senate develop a budget that reflects the values and needs of our communities," according to the Web site. "In order to create a balanced budget for the next two years, we will need to consider all ideas and be creative in finding solutions. All Minnesotans will need to be a part of the decision-making process." One place where especially tough decisions are taking place is New York City, the country's financial hub. On Friday, Mayor Michael Bloomberg, an independent, said the city may have to cut tens of thousands of jobs -- and increase the sales tax -- to deal with the city's $4 billion budget shortfall for fiscal year 2009 that begins in July. "We had prepared for a downturn, but I think it's safe to say nobody prepared for the severity of the downturn that we have been experiencing," Bloomberg said. In other cities around the country, the cuts in jobs and proposed tax increases weigh heavily on vulnerable small businesses, a vital asset to a municipality's economy. On January 26, Miami Mayor Manny Diaz, a Democrat, issued an urgent call to Congress asking it to help cities like his stay afloat. "Mayors across America are very concerned about the small businesses in their communities who are unable to borrow the funds they need to keep their businesses operating," he wrote in a letter to House Financial Services Chairman Barney Frank, D-Massachusetts, and House Ways and Means Chairman Charlie Rangel, D-New York. That concern for businesses, working families and governments during the recession will undoubtedly pressure politicians in the nation's capital to act fast. They are beholden, after all, to the same constituents who are feeling the pinch -- and fear tomorrow could bring even more bad news.